Tokyo, November 2, 2016 – Fuji Heavy Industries Ltd. (FHI), the manufacturer of Subaru automobiles, is pleased to announce that it has started production of the all-new 2017 Subaru Impreza in its U.S. plant, Subaru of Indiana Automotive Inc. (SIA). 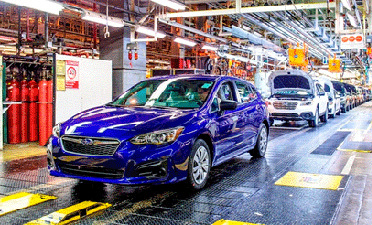 On November 1, 2016, the first-ever American-made Impreza rolled off the assembly line and SIA held a line-off ceremony with attendance of President Toshiaki Tamegai and Associates. To keep up with growing demand, SIA will increase its annual capacity from 218,000*1 to 394,000*1 units by the end of this year. The capacity will further grow to 436,000*1 units by March 2019.